The Thefts of the Mona Lisa: On Stealing the World’s Most Famous Painting is a book-length essay on the history, crimes, and mysteries surrounding Leonardo’s painting. Leonardo da Vinci’s portrait, called the Mona Lisa, is without doubt the world’s most famous painting. It achieved its fame not only because it is a remarkable example of Renaissance portraiture, created by an acclaimed artistic and scientific genius, but because of its criminal history. The Mona Lisa (also called La Gioconda or La Joconde) was stolen on 21 August 1911 by an Italian, Vincenzo Peruggia. Peruggia was under the mistaken impression that the Mona Lisa had been stolen from Italy during the Napoleonic era, and he wished to take back for Italy one of his country’s greatest treasures. His successful theft of the painting from the Louvre, the farcical manhunt that followed, and Peruggia’s subsequent trial in Florence were highly publicized, sparking the attention of the international media, and catapulting an already admired painting into stratospheric heights of fame. This book tells the art and criminal history of the Mona Lisa. This extended essay in book form, prepared to coincide with the 100th anniversary of the 1911 theft, examines the criminal biography of Leonardo’s Mona Lisa, with a focus on separating fact from fiction in the story of what is not only the most famous art heist in history, but which is the single most famous theft of all time. In the process this book also tells of Leonardo’s creation of the Mona Lisa, discusses why it is so famous, and investigates two other events in its history of theft and renown. First, it examines the so-called “affaire des statuettes,” in which Pablo Picasso and Guillaume Apollinaire were arrested under suspicion of involvement in the theft of the Mona Lisa. Second, there has long been a question as to whether the Nazis stole the Mona Lisa during the Second World War—a question that this book seeks to resolve. 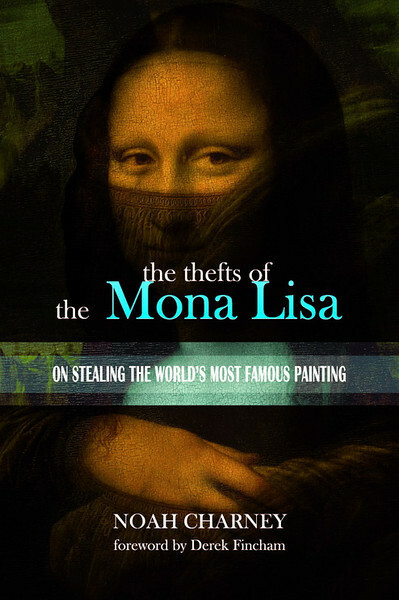 This book provides a strong introduction to the Mona Lisa and the thefts surrounding it. All profits from the sale of the print edition of this book support the charitable activities of ARCA, the Association for Research into Crimes against Art, an international research group on art crime and cultural heritage protection. To order a copy of The Thefts of the Mona Lisa, click here. On 2 August 2009, an “unhinged” Russian woman hurled a mug, recently purchased in the Louvre cafeteria, at the world’s most famous painting. The Mona Lisa by Leonardo da Vinci emerged unscathed and unscalded, the empty mug having ricocheted off of the bulletproof case that protected the painting. Guards quickly subdued the attacker, who put up no resistance and claimed to have targeted the painting as a means of protesting the fact that she had recently been denied French citizenship. This move was perhaps not the best way to ingratiate oneself to the French nation, but at least disaster was averted. The incident did point to some glaring holes in the museum’s multi-million dollar security system. While it’s nearly impossible to smuggle a weapon into the Louvre, apparently you can buy one at the cafeteria for €1.50 and bring it into the galleries. Had the woman targeted any other painting in the museum, unprotected by a bullet-proof cover, her projectile beverage could have done some real damage. The Russian woman was handed over to the police, and later admitted to a psychiatric hospital. But this was not the first time that Leonardo’s most famous portrait had been the object of attack. In 1956 the painting was twice assaulted. It was sprayed with acid, resulting in damage to the lower portion of the painting and several months in the museum’s conservation studio. The very same year a Bolivian named Ugo Ungaza Villegas hurled a stone at the painting—it stuck just beneath Mona Lisa’s left elbow, requiring further conservation. The portrait was encased in bullet-proof glass for its 1974 tour of Moscow and Tokyo. That did not stop a handicapped Japanese woman who, while the painting was on display at the Tokyo National Museum in April of 1974, sprayed red paint at the Mona Lisa, in protest against the museum’s policy for disabled visitors—the paint was stopped by the glass, but made an impression nonetheless. The painting currently resides in an incredibly elaborate case with temperature and humidity controls and even an anti-earthquake cradle system. Ironically, the most famous incident involving the painting, its theft by Vincenzo Peruggia in 1911, was made possible by the museum’s concern over vandalism. Fearing attacks by anarchists after the 1907 knifing of an Ingres painting, the Louvre staff commissioned the construction of glass cases to protect some of its most famous masterpieces. One of the workers assigned to prepare the glass to cover the Mona Lisa was an Italian painter working for the Louvre as a handyman—Vincenzo Peruggia.In this extended essay, prepared to coincide with the 100th anniversary of the 1911 theft, we will examine the criminal biography of Leonardo’s Mona Lisa, with a focus on separating fact from fiction in the story of what is not only the most famous art heist in history, but which is the single most famous theft of all time. In the process we will also tell of Leonardo’s creation of the Mona Lisa, discuss why it is so famous, and investigate two other events in its history of theft and renown. First, we will examine the so-called “affaire des statuettes,” in which Pablo Picasso and Guillaume Apollinaire were arrested under suspicion of involvement in the theft of the Mona Lisa. Second, there has long been a question as to whether the Nazis stole the Mona Lisa during the Second World War. The chapter on that event will strive to answer that question. It is because of these other events, coupled with Peruggia’s mistaken belief that the Napoleonic army had stolen the Mona Lisa from his native Italy, that this essay has used the plural in its title, The Thefts of the Mona Lisa.